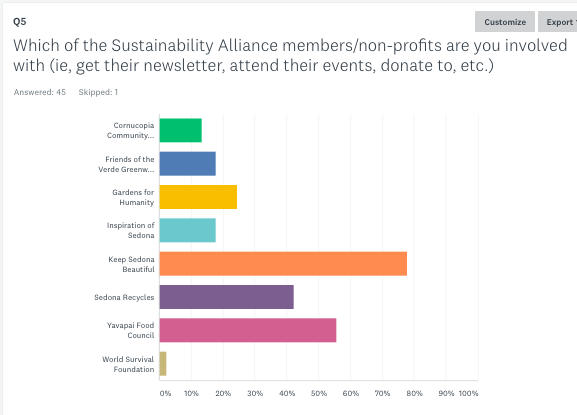 In November, 2017, the Sustainability Alliance conducted a survey of our organizations’ members to see what they felt the sustainability priorities should be in northern Arizona/Verde Valley. This was not a general survey of the public; we wanted input from people who are knowledgeable about aspects of sustainability. We based the primary question on internationally agreed-upon Sustainable Development Goals, a framework used around the world to measure progress toward a sustainable society. But depending where you live, some goals are more relevant than others. So we hoped this survey would help us understand what priorities might best be pursued here in this region. The results can indicate to our elected officials and non-profits what some of our members think should be goals to pursue as well as whether they are satisfied with current efforts or think more should be done. While the poll is still open, there were 46 respondents at the time this article is written. Please note, this was not a scientific survey and the sample size small, so the results should be used only to inform, not to make decisions. That said, there were some intriguing findings. This article summarizes what we learned. 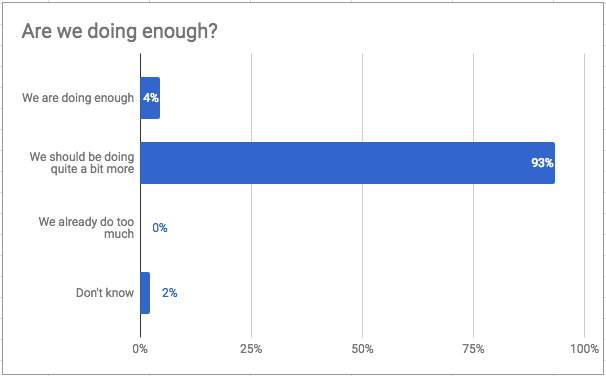 The main question in the survey asked respondents to choose up to 5 of the Sustainable Development Goals (SDGs) that we should set as local goals and then pursue. The SDGs are goals that are agreed to by virtually all nations, both developed and developing, so the issues and actions tend to differ based on where you are. For example, “Clean water and sanitation” in the developing world involves setting up toilets; in this region, it’s largely an issue of outstripping water resources with use and development. Communities and individual organizations can choose the SDGs most relevant to them and then have their efforts ‘roll up’ to international efforts. Just like rowing, you go farther faster when you synchronize your strokes. The following chart organizes the SDGs into categories, Economic, Social and Environmental, with the most important goal in that category first after the average of that category. Of course, all these goals are interconnected (eg, an economic goal can have direct impacts on the other categories.) But it can still be helpful to clump goals into related categories to see relationships. Overall, social and environmental issues averaged somewhat higher votes than did the economic area. This might be because the social/environmental issues seemed more urgent and could undermine our economy, or perhaps because of demographics, the respondents' perspective largely as retirees and some part-time residents. Regarding social issues in the community, quality education, sustainable communities and good health/well-being topped the list. We would like to see more schools and life-long-learning centers embrace sustainability science and practices and teach it to their participants. Sustainable communities may have gotten a lot of attention because of frustrations over transportation. We certainly hope that Sedona's current work on their Land Use Development Code and Building Codes will exemplify best practices in Smart Growth and green building. 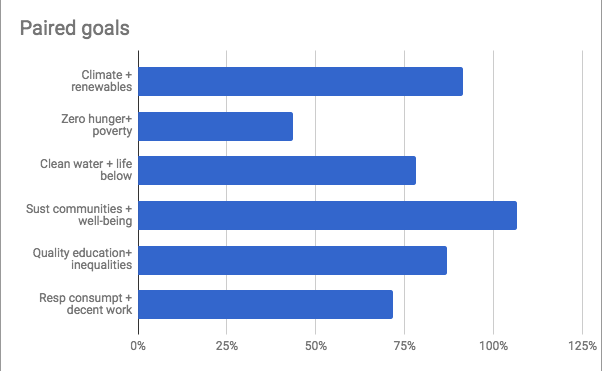 Since hunger, poverty and decent work show up on the chart as economic but are also social issues, you can infer that these interconnected issues are seen by the respondents as the next tier to address, along with reducing inequalities/homelessness. Note: We end up with over 100% when some respondents voted for both of the paired goals. Like many studies or surveys, this poll raises as many questions as it answers. More work would need to be done to refine the priorities. This survey is only a partial snapshot. 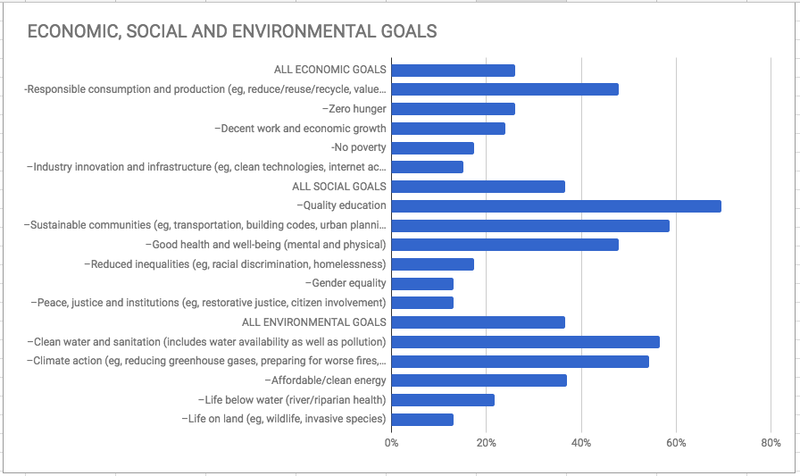 Some of these goals can be nested into a hierarchy so respondents might have factored those relationships into their answers. (For example, renewable energy is a part of climate action, so voting for climate action might have been intended as a vote for both.) So it would be helpful to follow up this survey with focus groups or interviews to understand the thinking behind the choices. DEFINITION: Sustainability targets and goals show an understanding of and commitment to sustainability. The targets should represent a fully sustainable state (often framed as zero ___ or 100% ___: zero waste, zero hunger, climate neutral, 100% living wage jobs, 100% renewable energy.) These may seem impossible to reach in the moment but are necessary for a fully sustainable society. They’re a way of declaring we don't intend to leave a depleted world to our kids. Those targets should be paired with time-limited, interim goals. For example, over 50 cities in the US have set goals for reaching 100% renewable energy by a particular date. Those goals are in service of a target which might be expressed as ‘climate neutral’ or ‘stabilizing the climate’ which will also necessitate changes to transportation, buildings and diet as well as hardening our infrastructure against climate-related impacts. ALIGNMENT: Once we have sustainability targets, different groups can organize around making these goals happen. The municipality, non-profits, businesses and citizens all have to play a role. The long-term sustainability targets can also put individual programs into context. Take for example the franchise hauling debacle in Sedona last year. If it had been clear we wanted to move toward zero waste, then perhaps more options beyond franchise hauling would have been considered and the ultimate intent to the community could have been more clear. We also need a process to engage other groups and individuals to have a larger conversation about how we would define our sustainability vision. Hopefully Sedona and the Sedona/Verde Valley Tourism Council will soon follow up on the Global Sustainable Tourism Council assessment results done last year. Perhaps our recommended next steps can be part of their scope of work. The vast majority of the respondents were from the Sedona/Village of Oak Creek area. 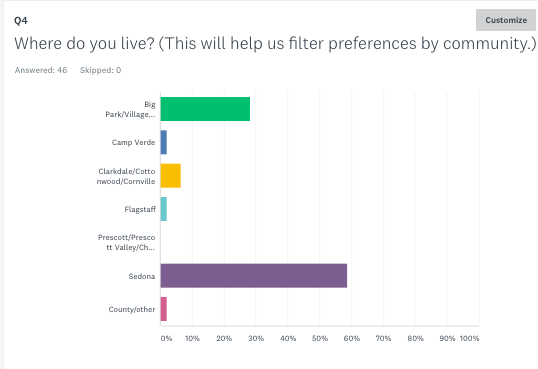 If any community is curious, we can filter the results for you, just showing what your residents answered. The non-profit members of the Alliance sent out a link to the survey to their respective members. In the chart below, you can see which organizations’ members were represented. Of course, there is overlap; individuals are often involved with multiple organizations. Over 75 percent of the respondents were associated with Keep Sedona Beautiful, but members of Yavapai Food Council and Sedona Recycles were also particularly well represented. How do they stay informed? 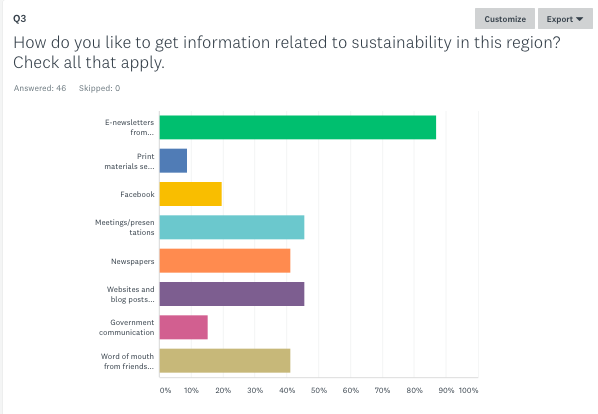 We were curious how the respondents liked to stay informed about sustainability-related efforts in the region. Electronic newsletters from the local non-profits are, by far, the preferred method, followed by websites and presentations, then word of mouth. Print materials were the least preferred—how sustainable!